Clarity is especially important when writing scientific methods papers, proposal, and reports. Journal referees and grant reviewers typically read many submissions in one sitting; they expect to quickly and easily understand the mechanics, significance, and potential contributions of your work. Once a project is published, readers expect to quickly and easily understand how they can use and apply your method in their own work. Improving clarity of writing is an iterative process that involves a lot of practice in writing, editing one’s own writing, and editing the writing of others. Clear, orderly writing is not a natural tendency for most of us because we don’t normally speak that way in conversation! Similarly, academic specialization leaves us in the dark concerning the amount of detail necessary to make a piece accessible to a broader audience. For most people, developing an intentional practice around routine writing tasks is necessary in order to improve writing skills. The first draft of any document can always be improved with multiple editing passes. One strategy to improve editing efficiency is to designate each editing pass to a specific editing component, keeping in mind your own personal weak areas. For example, you may first clean up mechanical errors such as spelling and grammar. Second, you may re-write sentences while considering a specific list of writing principles. Finally, editing for over-all cohesion and completeness of ideas can be easier once you have clean copy to work with. 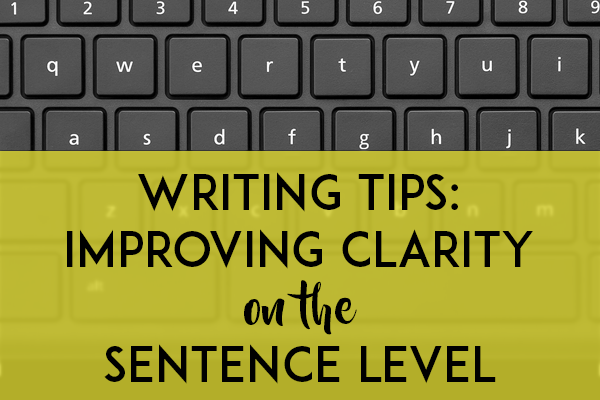 Here, we present five principles for clear writing on the sentence level. These guidelines are universal, yet particularly relevant to scientific and technical non-fiction writing. This structure makes sense in conversation, because you can emphasize how you did something with tone and inflection. We read in a more linear fashion than we speak; in writing, consistently placing the adverb before the verb makes it clear to the reader which action the modifier belongs to. Consistently ordering verbs and verb modifiers is especially useful when listing a series of actions that are each modified differently, such as in a protocol. When reading about a methodology problem, we usually want to first know what is specifically interesting about a concept, and then learn about the concept’s significance on a larger scale. These “flipped” sentences are common in first drafts and can be easily edited in a single pass. 3. Refine use of the dependent clause. A dependent clause is a group of words with a subject and a verb; alone, it is not a complete sentence and does not express a complete thought. We tend to use dependent clauses in writing because we tend to use dependent clauses in our own thought processes. This may suffice for problem-solving in our head-space vacuum, but, in order to effectively communicate with other people, we must completely describe these ideas in writing. 5. Add, remove, or modify an article used before a noun. An article is a word (the, a, an) that is placed before a noun to indicate the type of reference being made by the noun. The use of articles is tricky and, at times, a matter of stylistic choice. However, in scientific and technical writing, there are a few best practices for using articles to improve clarity. For example, articles can specify the volume or numerical scope of the noun. When articles are used to clarify numerical scope, first decide if the noun is one (singular) or many (plural), then choose to include or omit the appropriate article. Use the definite article “the” when you are referring to the one unique item or set of items. In descriptions of methodology, this type of article is commonly used to signal that the noun is a general concept, a broad system, or a one-and-only example. GTeX v6 project is one-and-only; future GTeX will presumably be v7! Use the indefinite articles “a” or “an” when referring to a general type or group of items. In descriptions of mythology, this type of article is commonly used to signal that the noun can be any member of a group. “A” is placed before a noun that begins with a consonant; “an” is paired with a noun that begins with a vowel. When using a plural noun, we typically omit the indefinite article. Developing an intentional writing practice can be as simple as scanning your work for sentences with potential for improvement. By designating editing passes to specific mechanical errors or types of sentence-level improvement, writing in a consistent, clear manner may become more habitual—and feel less like an exercise in foreign language class. In upcoming blog posts, we will discuss more ways to efficiently improve the structure and readability of papers. Our group has also published numerous blog posts on managing scientific labs and strategizing a graduate career. Articles presenting our advice on these subjects have become the top-viewed posts on our website: http://www.zarlab.xyz/advice/.